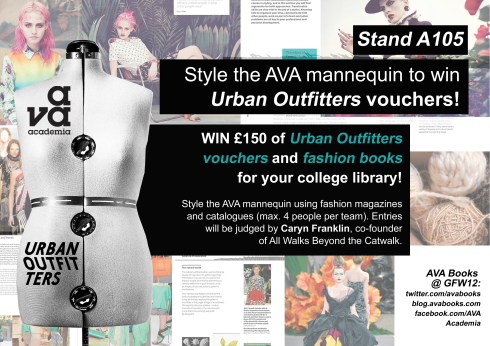 AVA and Urban Outfitters at Graduate Fashion Week! AVA and Urban Outfitters at GFW! We are very pleased to be attending Graduate Fashion Week at Earl’s Court again this year (10th-13th June) and we will be holding our mannequin competition again – but this time, Urban Outfitters have come on board and kindly donated £150 of UO vouchers for the winning team! 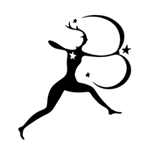 They will also win a set of AVA fashion titles for their college library. The standard of outfits last year was very high (you can see some of our favourite entries on the blog here) so this year we have asked an expert to do the judging for us. Fashion commentator Caryn Franklin, former host of The Clothes Show, co-editor of i-D Magazine, and founder of All Walks Beyond the Catwalk, will be choosing the winning outfit! If you will be at GFW this year, come to the AVA stand (A105) to enter – and in the meantime check out the Urban Outfitters store to see what you would choose with your winnings! We will be selling our range of Fashion Design, Fashion Management and Textile Design books at the show with discounts of up to 40%. 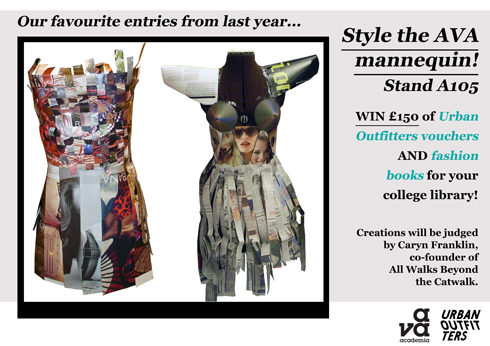 Next Post:GFW ’12 mannequin competition entries!